Ever wonder what mighty potion Vikings fortified themselves with as they crisscrossed the oceans? Or what King Midas was swigging from his golden goblet? The answer lies with the humble honeybee—and the sweet elixir it’s helped produce for millenia. Mead may be the ancestor of all alcoholic beverages. It’s enjoyed audiences with all manner of royalty, epic fictional heroes and even Greek gods. But its popularity has still sagged under the weight of history—until now. The ancient draught is staging a triumphant return, and you need to know what all the buzz is about. 1. Mead exists in its own distinct category, like cider. Mead is fermented with three basic ingredients: honey, yeast and water. It isn’t classified as beer or wine in the typical sense, but stands apart in its own rank of alcoholic beverage. You might hear mead referred to as honey wine. Not quite. Mead is created by fermenting honey, while wine is made from fermented fruit. And though mead is often flavored with various fruits, that does not make it wine. 2. It’s quite possibly the oldest alcoholic beverage on earth. Chinese pottery vessels dating from 7000 B.C. suggest evidence of mead fermentation that out-ages both wine and beer. The very first batch of mead was probably a chance discovery: Early foragers likely drank the contents of a rainwater-flooded beehive that had fermented naturally with the help of airborne yeast. Once knowledge of mead production was in place, the sweet beverage became globally gulpable, popular with Vikings, Mayans, Egyptians, Greeks and Romans alike. 3. The golden elixir was considered the drink of the gods. 4. Under the weather? Take a glass of mead. No need for a mead prescription these days, but certain kinds made with herbs or spices were used medicinally in early England. Infusing herbs into a sweet mead made them more agreeable, and different varieties were thought to improve digestion, help with depression and alleviate good old-fashioned hypochondria. These types of spiced, herbal meads are called metheglin, derived from the Welsh word for medicine. 5. 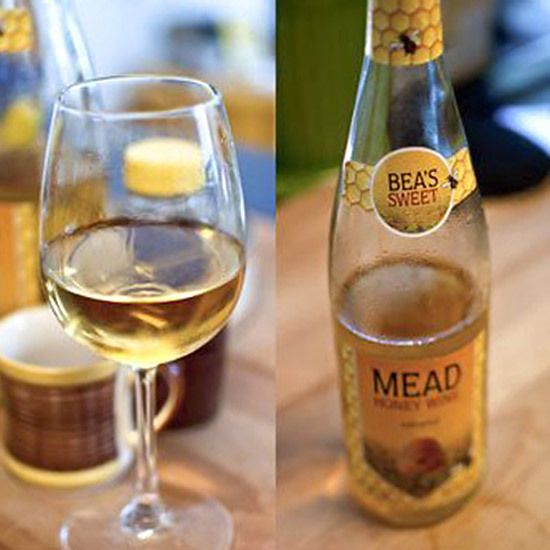 Mead’s flavor varies greatly depending on honey type. A single honeybee produces a meager twelfth of a teaspoon of honey per day. Because most meads require up to two gallons of the sweet stuff, every drop is precious. The honey used determines the overarching flavor of the mead, and can vary according to a honey bee’s particular diet of nectar and pollen. Traditional mead often uses a mild honey such as orange blossom, clover or acacia, but wildflower, blackberry and buckwheat honeys produce great results with sturdier, spiced meads. 6. Mead is incredibly diverse. Sweet, dry, still or sparkling—all describe varieties of mead. But amble up the mead family tree a bit further and you’ll meet some of the more eccentric relatives. You already know metheglin, but don’t forget melomel, a mead that contains juice or fruit like blackberries and raspberries. Then there’s cyser, an apple-based mead; acerglyn, made with maple syrup; braggot, a mead/beer blend brewed with hops or barley; rhodomel, a very old style laced with roses—and legions more. 7. You’ll find frequent mead references in classic literature. The best part of Chaucer’s Canterbury Tales? When the mead starts flowing. In The Miller’s Tale, mead is described as the draught of townfolk and used to court a fair lady. Chaucer also makes mention of spiking his claret with honey—clearly he had a sweet tooth. 8. Mead is a preferred drink of royalty. Queen Elizabeth has been known to throw back a golden goblet or two and even maintains a favorite mead recipe made with rosemary, thyme, bay leaves and sweet briar. And King Midas with his golden touch? His tomb was discovered in Turkey and revealed the remains of the king’s funeral feast. Guess what was found in the ancient drinking cups: sweet mead residue. 9. You can thank mead for your honeymoon. Stop slurping oysters: Sweet mead is the original aphrodisiac. The origin of “honeymoon” harks back to the medieval tradition of drinking honey wine for a full moon cycle after a new marriage. All that golden essence would supposedly ensure a fruitful union bearing plenty of children. This mead-based insurance policy was taken so seriously that a bride’s father included a month’s worth of mead in her dowry. 10. Craft mead is on the rise. Mead isn’t just the drink of Greek gods and mummified kings. There are now almost 250 meaderies in America, and the resurgence of this radiant juice seems assured, due to continued interest in craft brewing and distilling. A couple promising signs: Local mead festivals are cropping up around the country to pay tribute to the ancient quaff, and chef René Redzepi of Noma—rated the best restaurant in the world—has revived industry interest in mead by using it in his dishes. Ready to jump headfirst into the honeycomb? It’s surprisingly easy. Try your hand at homemade mead-making with a DIY starter kit, similar to beginner homebrewing setups—but with a bit more buzz.